I would like to thank the Department of Mathematics of the University of Bergamo, and especially professor Emilio Spedicato, who asked me to give a lecture on Andrea Luchesi. This allows me to reveal some falsities and reticences which hinder this musician's right appraisal and the understanding of his role in the birth of Haydn, Mozart and Beethoven's myths. Already in 1806, abbot Giannantonio Moschini described him as the well-known L.uchesi della Motta, then music master at the Cologne Elector's court (in Bonn), where he richly married and where he enjoyed every privilege.1 Although his name can be found on the head of the chapel in twenty Cologne court calendars, and his contacts with the three mythical figures are supported by documentary evidence, his name was expunged from their biographies. It is therefore only right to talk of erased genius, and not misunderstood, as the German musicologists have always been aware that his reappearance would cancel the myths built around the great self-taught people of the "Wiener Klassik". "Ettore Majorana drew a small piece of paper out of his pocket It was a schedule that he had calculated in the last 24 hours turning the Thomas-Fermi's non linear equation of second degree, following Segre's recollection, into a Riccati's equation, that he had then numerically integrated". Jacopo initiated his son Giordano (1709-1790) into mathematics. Giordano had a didactic and artistic relationship with Andrea Luchesi. Vincenzo, a Jesuit, was compared for his importance to Euler, Leibnitz and Daniel Bernouilli. He was considered as the best Italian mathematician of his time; Francesco stood out in the field of architecture. Thanks to his strict coherence, characterizing every moment of his artistic or scientific activity, Luchesi learns from the theorist Riccati (more than from the more skilled Vallotti) the correct way to get music problems underway and to solve them. Beethoven, Antonin Reicha (teacher of Liszt, Gounod and Berlioz) and the other pupils who had him as a teacher in Bonn, through him could discover the theoretical studies begun by Calegari, carried on by Vallotti and spread by Riccati. A long musical path, which went far, and that therefore deserves to be reconstructed in a more exact way than we can do here. Andrea Luchesi was born in Motta di Livenza on the 23 May 1741; his father Pietro was a rich corn wholesaler. His elder brother Matteo, a priest, an organ player and a public tutor gives him a culture allowing him to attend Venice noble salons. He associates an inborn fondness for music and deep studies with the best teachers of the town and he improves thanks to his relationships with the Paduan school's representatives. At the age of 22, on suggestion of the count Giacomo Durazzo, he gives prince Nikolaus Esterhazy the first of several symphonies nowadays thought to be Haydn's6. In 1764 he sets to music the important service for S. Lorenzo convent; the following year he starts out in the Hoftheater of Vienna with "L'isola della fortuna" ("The island of fortune"), an opera buffa which will be performed once again in 1767 at the Royal Theatre of Lisbon. Perhaps Luchesi is the first one to compose concerts for cembalo in the form of a sonata; in February 1771 he lends one of them to Mozart, who uses it still in 1777-78 during his travel to Mannheim and Paris. When he arrives in Bonn, the "famous Luchesi" has operas, cantatas, symphonies, quartets, sonatas and a lot of sacred music for public and private holidays to his credit. Thanks to the Notatori of the N.H. (Nobil Homo) Pietro Gradenigo I could ascertain that the Elector of CoIogne called for Luchesi to remedy the damages caused to the chapel of Bonn by the direction of Ludwig van Beethoven, the Titan's grandfather. Luchesi's assignement in Bonn can be compared only to Galuppi's three-year long stay in St. Petersburg to give a new life to the chapel of Catherine II of Russia. Beethoven was a life-long Kapellmeister, but when he suddenly died, the prince offered the position to Luchesi, rather than to Johann van Beethoven, the Titan's father. As his new position would compell him to put his works anonymously and free in the music archives, Luchesi reaches an agreement and begins to create instrumental and theatre works under the names of Joseph Haydn and his brother-in-law Ferdinand d'Anthoin; these works will be payed to him as purchases from outside until 1784. 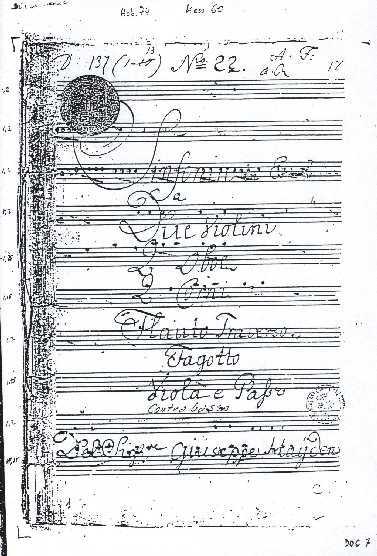 Since May 1774 Luchesi officially produces sacred works that today are still considered as anonymous; today you can find these works in the Estense Library of Modena, where the music file of Bonn arrived during the 19th century. But the contractor and musicologist Benjamin de La Borde points out that in Germany his symphonies were hunted for the new ideas, the terse plot and the special gracefulness of the style7. "The name NIC HEISLER, that can easily be found as watermark in the Este manuscripts containing Andrea Luchesi's music produced for the musical chapel of Bonn, and therefore of sure Electoral origin, (…) this name relates them to D-136-141 (…) the presence (of the letters A. R. and A. F.) on D-137 excludes the mere confluence of these sources in the Modenese file; however it allows us to think that they are parts of two linked paths or two stages of a shared path". The initials A. F. and A. R. don't allow us to think anything different. They are the initials of those who helped in the inventory drafting, included the one finished on 8 May 1784, the last one drafted in Bonn. If the number stays the same, only the initials can witness the actual filing. The presence of the initials only tells us that D-137 was registered three times under the number 12. D-146, bearing the numbers 9 and 31 and an initial, was also inventoried three times, and once the number was changed. (See documents 5, 6 and 7). However the watermark NIC HEISLER singled out Swiss paper factory belonging to the Heusler family of S. Albantal, near Basel, and it is almost impossible to find it in places far from the Rhine Valley after 178411. This bereaves Robbins Landon's theory of any value; he says that the Modenese copies deserve no attention because they are late, as the watermark NIC HEISLER would indicate a 1820 Modenese paper factory12. Moreover, the Lockenhaus-Esterhazy paper on which Haydn writes D-138 and other autographs dated 1762/75, is surely later than 179513. Therefore Haydn's copies were born twenty years after the composition. The 28 symphonies D-131/158 were therefore inventoried in Bonn as "de differents auteurs" ("by various authors") and the current registration under the name of Haydn proves that the group has been tampered with after the inventory. The expression "by various authors", approved by notary Fries, assures that the authors of the symphonies were at least two. Haydn became therefore the author of those works which, in the inventory of 8 May, hadn't been assigned to him. The title pages removed in four symphonies prove this theory. 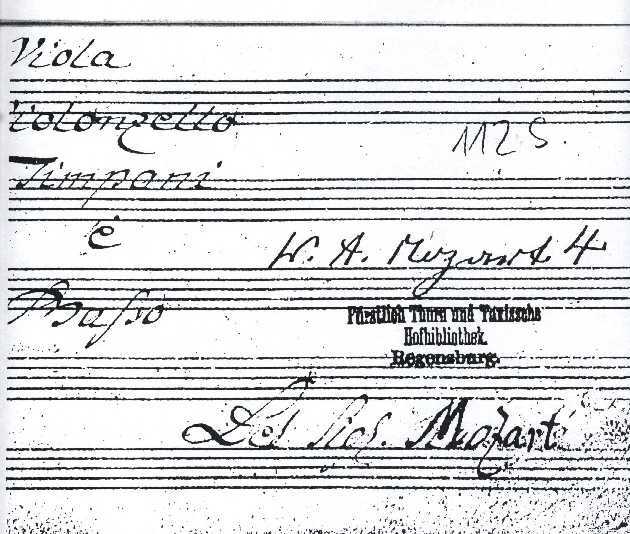 We are equally sure that also the ten Mozart's symphonies have been tampered with; here there is an aggravating circumstance: the name of Mozart doesn't appear in Neefe's inventory. 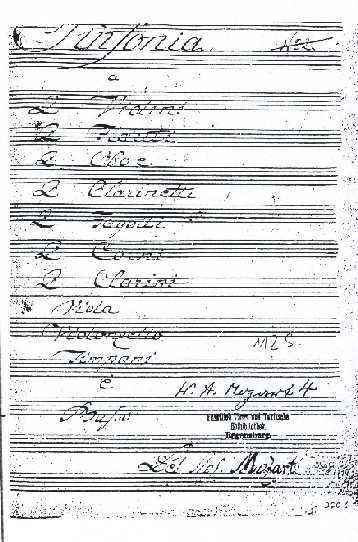 Independently from the Modenese file we have two (unrelated) pieces of evidence proving that the paternity of K.297 Pariser is wrongly assigned to Mozart. In June 1778 at the Concert Spirituel Mozart tried to pass off it as his, and as a result he was ignobly thrown out of Paris; baron Melchior von Grimm put him on the first stage coach to Strasbourg14. 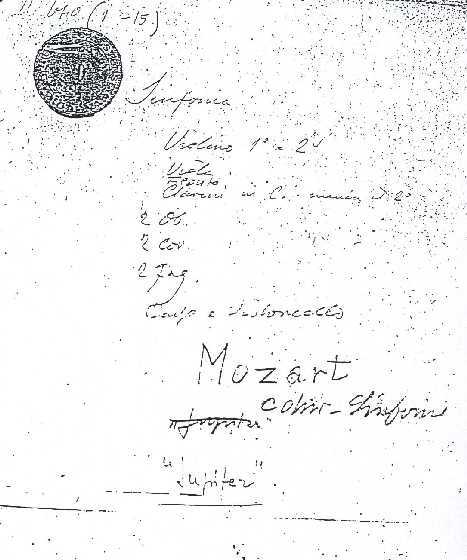 In a copy kept in Regensburg, Mozart's name is written on another one, erased but still visible (see documents 1 and 2). We are sure that the Modenese copies of K.504 Prague (document 3) and K.551 Jupiter (document 4) in May 1784 were in Bonn and this excludes Mozart's paternity. Mozart recordes them in his private catalogue on 6 December 1786 and on 10 August 1788. The Koechel catalogue says nothing about them because their presence in Modena is the obvious consequence of their presence in Bonn during the month of May 1784. The Hapsburg establishment hid the dangerous musical file of Bonn, not to leave it to the enemy Prussia, heir of the Principality of Cologne. The archives weren't Max Franz's, but they belonged to the principality, therefore the Hapsburg family is guilty of embezzlement and the duke of Modena of receiving stolen goods, two crimes which can be easily justified if we take into account the importance of the stakes. This file has always been managed by Vienna and the Austro-German musicology has always been aware of how dangerous the Fondo Lucchesi (the Luchesi File) was for the Wiener Klassik myths. There are no self-taught geniuses. b) the works are not made by him. In both cases we can talk of mystification. Ludwig van Beethoven belongs to the case a). The hidden master is Andrea Luchesi, Kapellmeister in Bonn from 1771 to 1794. His teaching concerns the whole Beethoven's education in Bonn18. During the Beethovenian meeting held in Berlin in July 1999, Dr. Luigi della Croce pointed out that Luchesi is the only master able to give an explanation for Beethoven's greatness, and on 25 January 2000, at the Associazione Mozart Italia (ltalian Mozart Association) in Brescia, he indicated him as Mozart's master as well. At the same time Dr. Della Croce singled out two exact reasons why Luchesi had been wiped out by the Austro-German musicology which, in the past two centuries, has been lavishing care and arrogance. This is why Luchesi was stolen his three quartets with piano WoO3619 - from which Beethoven took inspiration far a sonata included in the op. 2 and for the Patetica - and his cantatas dedicated to Giuseppe II (WoO 87) and to Leopoldo II (WoO 88). 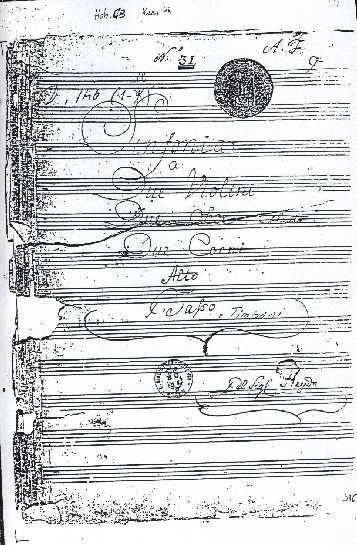 The first one is especially dangerous for Beethoven's myth because the "cantabili", the expressive and tied melodies which appear in this work will be found once again in the Fidelio, in the Missa Solemnis and even in the Ode to the Joy of the Ninth Symphony20. To the case b) belong the two other "Wiener klassik" mythical figures, who give us other reasons which can explain why Luchesi had been wiped out. Haydn owes his fame and fortune to the great advertising operation made by Giacomo Durazzo, who tried to increase family Esterhazy's glory. The prince exclusively bought the works he then registered in the name of Haydn, but the only one who was authorized to grant Haydn's griffe was Bernhard von Kees from Vienna, who also kept a catalogue. "Haydn's symphonies" are Giovan Battista Sammartini's from Milan21 and, since 1763, Andrea Luchesi's as well22. In 1776 Haydn forgot to list in his curriculum the 60 symphonies which at the time were thought to be his; this shows that he ignored the existence of many of them. Once 256 symphonies were registered in his name, but today they are only 104; all these remaining should be returned to Sammartini and Luchesi, except Hob.25, probably written by Dittersdorf. "On Monday Mozart composes like Haydn and on Tuesday Haydn composes like Mozart. This was a favourite Viennese joke in the middle of the nineteenth century (p. 202). (…) Haydn's share in the tragedy of Mozart death was spiritual; with the death of Mozart the sense of an invisible communion increased. Haydn felt as though strengthened and befriended by some supernatural agency. Traces of this effect can be discovered in his works of 1791. In the following year, which began for Haydn with the news of Mozart's death, it is far more evident. It is not necessary te interpret this influence in any mystical sense, what happened was no more mysterious than spiritual changes always are. After the old master had for so long been the giver, the relationship between the two composers changed with a suddeness that, indeed, was Mozartian in character. As we know, nine years earlier Mozart had suddenly become a disciple of Haydn; now Haydn became a disciple of Mozart. Now the latter was paying posthumously his debt of gratitude by adding his genius to the genius of the older master" (p.201). For the last two centuries the correctness of the attributions and the greatness of the two "music geniuses" are thought to be confirmed by such nonsense and by Robbins Landon's forgeries, that can be found, in more or less imaginative versions, in Haydn's and Mozart's biographies. Logic excludes any odd hypothesis and ectoplasm. Luchesi diversified his production; he wrote ordinary symphonies for Haydn, and more sophisticated works for Mozart. Christmas 1790: during his trip to London, where he was involved in an undertaking with Johann Peter Salomon, Luchesi's brotherly friend, Haydn stops in Bonn where, of course, the italian Kapellmeister gives him works similar to those he gives to Mozart. The resemblance among the works dated 1791 comes before Mozart's death on 5 December 1791. But "Mozart's" symphonies dated 1792 bear witness that their author wasn't dead on 5 December 1791 but, however, he keeps working for Haydn. On the other hand, the official end of Haydn's production testifies that Luchesi's death on 21 March 1801 stops the necessity to pretend any productive skill in Haydn, who for the last years had been living in a larval condition because of the encephalosclerosis26. This is the mystery. The self-evident Beethoven's dependence on Mozart's and Haydn's models is simply the natural consequence of Luchesi's long lasting teaching, as we knew that the school style spreads like in a family, from master to pupils"27. Therefore we should consider the Wiener Klassik as a whole italian phenomenon. The famous idiot Haydn28 didn't compose any symphony, and those which are still registered in his name are Sammartini's and Luchesi's; the high masses and the oratori aren't his as well. We have discovered seventy works which aren't his and this witnesses that Mozart is still a common name29. His best symphonies have to be ascribed to Luchesi; Beethoven could become a genius of music thanks to the long and accurate teaching he received in Bonn from the Kapellmeister Andrea Luchesi. Since 216 years ago, since 8 May 1784, one has attempted to hide the truth. 1 G.Moschini, Della letteratura veneziana ecc., Venezia 1806 p.221. 2 Restauri di Marca n.2 (December 1992), Ed.Coop. DiEmmeCi, Villorba (Tv) 1992, p.88-90. * (…) then I created a four fugue and I would like you to correct it and tell me your impression. I dared write you as I know your innate kindness. ** Reading your letter, it seemed to me that you approciated my fugue; I'll surely continue to take advantage of your opinions and I'll try to put into practice the knowledge you conveyed me in Castel Franco. I dared send you Saratelli's basses as I enjoyed copying them together with the fugue. It is with pleasure that I wait for Friar Minor Vallotti's themes, that you'll kindly send to me. 3 P. Revoltella, Musiche di Vallotti nell'epistolario di Giordano Riccati, in AA. VV. Contributi per la storia della musica sacra in Padova, Padova 1993, p.269 and following. *** I was extremely glad to receive your letter with the three Friar Minor Vallotti's themes . I read them over and over to understand the stratagems and the work: here, in a constant unity, I can see how he modulated the subsidiary sounds, he didn't fill up with useless sounds; there I can see how he worked with turnings and dissonances, which are organized with so much skill that it seems that everybody could do the same, but there is the greatest art. I hope to learn a lot from them; I would be disappointed if you, after having excited my curiosity, left me without sending me other precious things to satisfy my longing to Knowledge. During Padua Fair I'll be at the Teatro Nuovo (New Theater) to play the harpsichord. I'll see that Friar Minor Vallotti gives me a lesson, perhaps also thank to you. 4 AA. VV, Padre Martini. Musica e cultura del '700. (A.Pomilio) Firenze 1987, p.173-209. 5 G.T. Bagni, Vincenzo, Giordano e Francesco Riccati, Treviso 1993, p.123. **** Giordano Riccati's conceiving of architecture can easily compared to that of music: mathematics and, more in general, the rational approach, cannot be left out from the human, culturale engagement, in every discipline, in every phase of the creating process of a work. Human reason, built and educated through the study and the practice of exact sience, become the path to follow, the sure guide, the support in the right conceiving and carrying out of a work of art. From this point of view the study of the counterpoint laws or the use of the harmonic mean when trying to imagine and planning an ideal proportioned construction, are expressions of the will to reach and code the reason's control of the emotions, that have always reached men through the artistic message. 6 G. Taboga, A.Luchesi.L'ora della verità, Ponzano Veneto (Tv) 1994, p.84 and 86. 7 J.B. de La Borde, Essai sur la musique, Paris 1780, Vol.III, Luchesi Andrè. 8 Grove 5° 1964, Lucchesi Andrea. 9 J.N. Forkel, Musikalische Almanach für das Jahr 1789, Leipzig 1788, p.84 - Reprinted Olms 1974. 10 C. Valder-Knechtges, Die weltliche Werke A.Luchesis, Merseburger, 1984, p.100 and following. 11 Johson-Tyson-Winter, Beethoven's Sketches, Oxford U.P., p.516. 12 H.C.Robbins Landon, The symphonies of J.Haydn,London 1955, p.611 and 613. 13 Ibidem p. 61.The author tries to make J.P.Larsen responsible for the forgery. 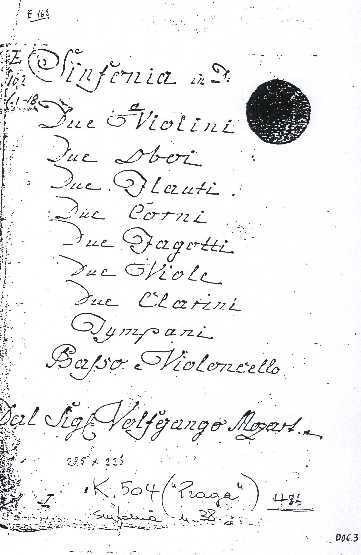 14 Leopold Mozart's letter to his son dated 10 October 1778, in J. et B. Massin, Mozart, Paris 1988, p.280. 15 Musikalische Almanach für das Jahr 1789, ref. p. 69. 16 T.A. Henseler, Andrea Luchesi, der letzte Bonner Kapellmeister zur Zeit des jungen Beethoven, Bonn 1937, Introduction. 17 Vincent d'Indy, Beethoven, Paris 1952, p. 6. ***** "It seems clear that each artist-creator's career should be divided into three periods, which are different because of the kind of their works: the three periods could be identified as imitation, transition and meditation. During the first one, after having studied the rules and the traditional procedures of the profession, the artist will imitate… All the great pioneers of poetry, painting or music, Alighieri, Molière, Gozzoli, Rembrandt, Bach and Wagner included, all of them were subjected to this rule. It disproves the too easy theory of the self-taught geniuses, a theory which, you should agree with me, is not represented by any example in the whole history of art". 18 G. Taboga, A. Luchesi e la cappella di Bonn, Restauri di Marca n.3 (special issue), ref. p.11-41. 19 G. Taboga, L'assassinio di Mozart, Lucca 1997, p.190. 20 Poggi-Vallora, Beethoven, Torino 1995, p.578. 21 G. Carpani, Le Haydine, Padova 1823, p.62. 23 M. Solomon, Mozart, Milano 1999, p.74 and 79. 24 H. Abert, Mozart, Milano 1956, Volume I, p.461. 25 H.E. Jacob, Joseph Haydn, New York and Toronto, 1950, p.201 and following. 26 Graphologic study made by professor Sante Bidoli on Haydn's mental condition in 1802, never published. 27 P. Lichtenthal, Dizionario e bibliografia della musica, Milano 1836, Volume II, ref. Stile. 28 Carpani, Le Haydine , p.252. 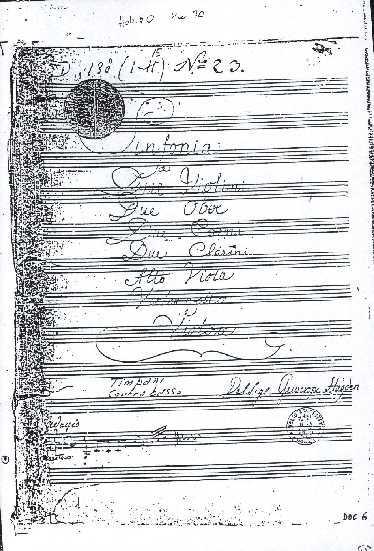 29 B. e J. Massin, Mozart, Introduction II. Conference given in Bergamo, April 6, 2000. Testo pubblicato in: Quaderni del Dipartimento di Matematica Statistica, Informatica ed Applicazioni, Serie Miscellanea, Anno 2000 N. 4 - Università degli Studi di Bergamo, via Salvecchio, 19 - 24129 Bergamo - Italy . Si ringraziano per la traduzione Emanuela Zonca ed Emilio Spedicato. Giorgio Taboga è nato a Venezia nel 1933, e si è laureato in Scienze Economiche all'Università "L. Bocconi" di Milano. Dopo diverse esperienze di lavoro in Lombardia, Toscana ed Emilia-Romagna, è rientrato nel natio Veneto e si è dedicato all'insegnamento. A Motta di Livenza, dove è vissuto per oltre quindici anni, ha preso origine il suo interesse per il musicista Andrea Luchesi, artista che lo affascina come persona al di là del valore della sua musica. A seguito di quasi vent'anni di studi è giunto alla convinzione che il caso di Andrea Luchesi sia forse il più eclatante di una lunga serie di artisti e scienziati italiani ingiustamente ignorati o cancellati. Da questa convinzione nascono i suoi lavori Andrea Luchesi e la cappella di Bonn (1993), Andrea Luchesi. L'ora della verità (1994) e L'assassinio di Mozart (1997), oltre a numerosi articoli su riviste italiane e straniere. Ha anche dedicato la sua attenzione a Faustino Perisauli (1450?-1523), poeta romagnolo precursore ignorato di Erasmo da Rotterdam. Attualmente sta completando la seconda parte della biografia di Luchesi, gli anni di Bonn (1771-1801), quando il Maestro fu l'insegnante di Beethoven e fornì sua musica a J. Haydn e W.A. Mozart. Dai suoi studi emerge la certezza che la storia della musica della fine del '700 vada riscritta in base a documenti, rifiutando il miracolismo interessato e fideistico che impera oggi negli scritti sui tre grandi della "Wiener Klassik", Haydn, Mozart e Beethoven, tutti e tre seppur in diversa misura debitori della loro grandezza all'oscuro e cancellato maestro italiano.